Description Oswego Review 7-15-1954 article: Little Indians 'Scalps' library of its books. 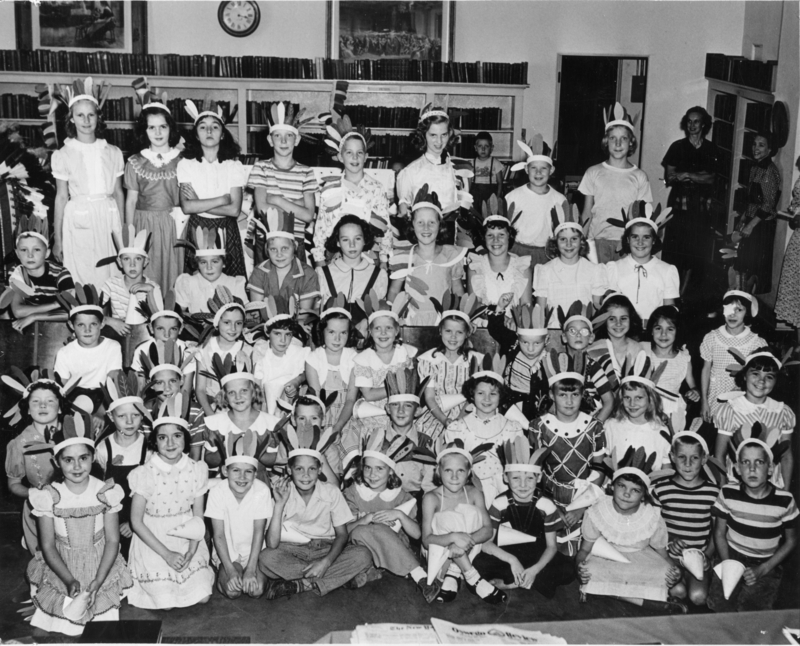 The Oswego library has 394 young Indians listed as working to get their headdresses -- with a feather for each book read. Twenty-five finished their headbands, having read at least 21 books. Larry Bieber, with 66, is away out in front of the young Indians. Geraldine Charlton is second with 47. Others in the over-21 class are: Anne Thompson, Krain Halvorson, Kitty Inkster, Judy White, Maureen Pinkney, Kristi Jo Leibel, Don Schallander [Schollander? ], Donna Vaught, Delight Holden, Linda Hildebrand, Toni Lou Berke, John King, Joel Hermsen, Scott Fewel, Susan Herald, Kristin Gallagher, Doug Dewar, Brian Mount, Kathy Jones, Marilee Cole, Diane Sykstra, Jimmy Dahl, and Judy Jaurene. Others who have completed 12 books and entitled to attend the big Indian pow-wow are: Patsy Cruden, Suzanne Bauteh, Kathy Mullen, Arthur Mears, Patty Park, Brenda Trainer, Sandy Cook, Warren Anderson, Jean Youngbar. Doug Lindsay, Eddy Stevens, Mary Rae Fahey, Linnea Nelson, Lucy Cohan, Tim Town, Paul Schmidt, Roger Liddell, O'Timothy Moore, David Paine, Carl Smith, Carolyn Shipley, Gary Austin, Bob Barnes, and Mike Reuther. Physical Description H 8.25" x W 10"